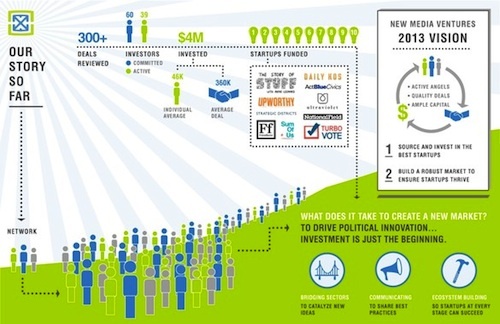 San Francisco based New Media Ventures is a network of 60 angel investors that funds startups that allign with its mission to drive "political innovation." So far it has invested about $4 million in ten startups such as Upworthy, which was featured by David Carr in the New York Times; NationalField, TurboVote and the Story of Stuff. NMV looks for startups that combine new media with technology, and are passionate about shaking up the political process through greater citizen engagement. NMV's roots lie in the Democracy Alliance, another initiative that funds progressive organizations... NMV, however, is more focused on early-stage, new media and tech-focused innovation--think the next MoveOn.org or Huffington Post. The investments are not handouts, they are designed to build profitable companies so that their work can be self-sustainable. NMV is very much aware of the tensions for-profit organizations can create in the political space where non-profits are the norm, and corporations of any size, even tiny startups, are looked upon with suspicion if they seek to profit from their work. The Angel network plans at least 12 investments in 2013.